Windward Community College celebrates the holiday season with performances by students and special musical guests during a week of concerts at Palikū Theatre December 3–7. All performances are free and open to the public. Monday, December 3, 5:30–7:30 p.m.
A voice recital performance under the direction of Sarah Connelly will feature a guest artist from the Hawaiʻi Opera Theatre Mae Z. Orvis studio program. Wednesday, December 5, 7–9 p.m.
ʻUkulele and slack key guitar students perform under the direction of Kamuela Kimokeo, featuring guest artist Robi Kahakalau. Thursday, December 6, 7–9 p.m. 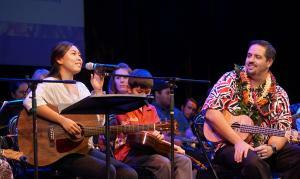 Early College ʻukulele and slack key guitar students perform under the direction of Ron Loo, featuring guest artists Kelly Boy DeLima, Pila Nahenahe, Jody Kamisato and Honoka. Friday, December 7, 7–9 p.m. Piano program students perform under the direction of So Jin Kimura. For more information about the Windward CC music program and new certificates designed for performing artists, contact Kamuela Kimokeo at (808) 236-9131 or kamuelam@hawaii.edu.